The Blue Lotus Water Garden and Nursery is a seasonal venue open to the public from late December until mid-late April each year. The closing date of our venue changes each year to co-inside with the end of the Victoria school holidays in April. All facilities including the nursery, cafe and gift shops have the same open dates and times as the gardens. NOTE: No admission 30 minutes prior to garden closing time. Please check home page for any notice of change to open hours. The gardens contain numerous onsite facilities including picnic shelters, accessible toilet, baby change station, drinking water bubblers and more. Visitors are welcome to bring their own food and drinks into the gardens except alcohol. Or you can purchase food and drink from the onsite cafe & kiosk located inside the gardens. The Blue Lotus Water Garden is approximately 1.5 hours by car or bus from Melbourne CBD. If you are coming from Melbourne, take the Eastern Fwy out of the City heading East, then take the Ringwood Bypass just out of the Melba Tunnel. Turn left onto Maroondah Hwy and keep going for 20 minutes until you meet the intersection of Warburton Hwy just past the town of Lilydale. Turn onto Warburton Hwy and travel east for 25 minutes until you reach Yarra Junction. Travel a further 1km past Yarra Junction township and you will find us on the right hand side just past the Little Yarra River bridge. Look for the PINK flags at the front entrance. It takes approximately 2 hrs to reach the gardens from Melbourne’s CBD via public transport. Catch the train from Flinders Street Station to Lilydale. 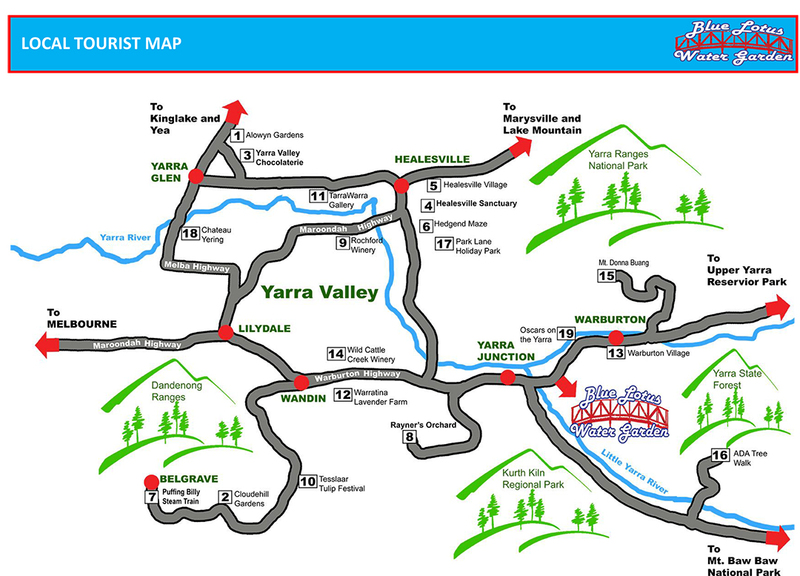 Then catch the Martyrs Bus Service from Lilydale Station to Yarra Junction. The nearest bus stop to the garden is at the intersection of Warburton Hwy & Riversdale Rd, Yarra Junction (also known as Upper Yarra Secondary College bus stop). The gardens entrance is about 300m (5min) walk east along the highway from the bus stop. The Yarra Valley is blessed with many great things to do, see and experience. Near the gardens we have numerous tourist attractions, tourist villages, activities, national parks, places to eat and places to stay. Download our nearby attractions and accommodation list and map on the link above.